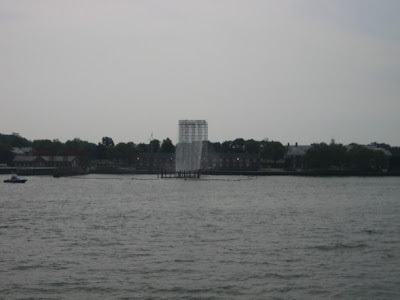 is a "a monumental-scale public art installation conceived by the Danish/Icelandic artist Olafur Eliasson." 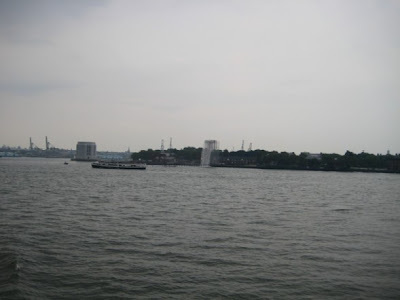 The Waterfalls features four 90- to 120-foot-tall man-made creations installed along the East River: one at Pier 35 in Manhattan, north of the Manhattan Bridge; one on the Brooklyn anchorage of the Brooklyn Bridge; one between Piers 4 and 5 in Brooklyn adjacent to the Brooklyn Heights Promenade; and one on the north shore of Governors Island. The Waterfalls will flow daily from 7am to 10pm (and on Tuesdays and Thursdays from 9am to 10pm) and be lit after sunset. This will be displayed from June 26, 2008 until October 13, 2008. Be sure to check it out when you're here in New York City! Or if you already live here, take a trip downtown to see them.